Steamed squid is a regular offering in dim sum restaurants and is a dish I rarely pass up. Sometimes, you find squid steamed with a curry sauce but, in my experience, the curry sauce usually served is a bit insipid and I generally don’t care for it. The offering you see pictured above is one I was recently served at the Yangtze Dining Lounge in Ottawa. Most of the dishes I had that day were not actually that great but this particular one was first class. Commonly, squid pieces are often dusted in a flour of some sort before steaming but these were steamed ‘clean’ and the effect was very well done. The pieces of ‘tube’ were very plump and thick and I would have guessed that they came from a fairly large specimen but the tentacles that were also steamed alongside were obviously from very tiny squid. I am not sure if the body flesh came from a different animal than the tentacles, or whether the flesh ‘plumped’ up during the steaming process. 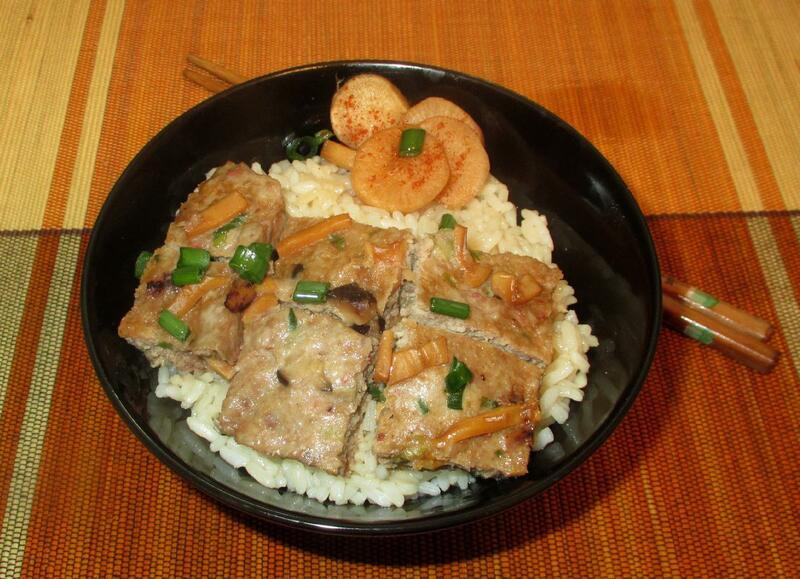 In any event, the cooking was expertly executed and the result especially tender. As usual, ginger, and a little scallion were added, and both of these were added deftly so as to just give a hint of their presence in the background. I have had this dish many times, both at home and in restaurants, and this was one of the best. The dish was called Calamari ‘Manko’ …. I have no idea of the origin of the name ‘Manko’ and a search only yielded the fact that it is a very rude Japanese slang term (I’ll let you Google it yourselves). The menu described the dish as being squid ‘tossed with curry leaves and toasted coconut [and] served with a tomato chutney’. In fact, the ingredients were actually served ‘in’, rather than ‘with’ the chutney, which, in addition to the tomato, included mustard seed and coriander leaf. Toasted dried chilies were almost added to the mix, lending an almost ‘Sichuanesque’ effect to the overall taste, which was unusual, but really nicely done. The squid was cooked just perfectly, being tender, but still a bit chewy, and there was a sweetness that came in part from the toasted coconut, but, probably, also from the addition of a bit of sugar. Anyway, I almost didn’t bother with doing a post, given my photographic lapse, but the fact is, these were really terrific and worth a mention. Each little sphere was coated in a very thin batter (or maybe just dusted with a starch of some sort), but it was the ‘innards’ that really shone. 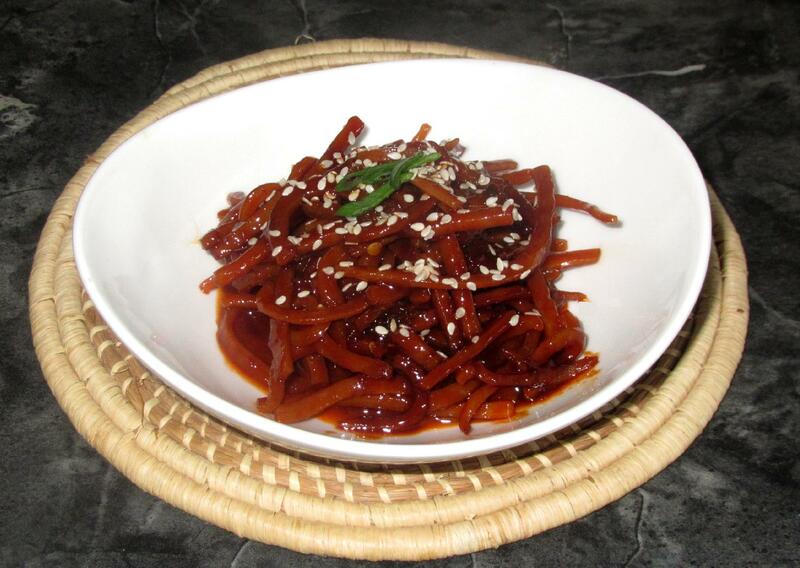 On a few occasions, I have ordered squid dishes in restaurants that consisted of the tentacles only. Mostly, these are the large type, and often come battered, as separate pieces, before being deep-fried. When I buy very tiny squid (which have been the only sort available up in these parts of late), I like to keep the whole tentacle ‘assembly’ in one piece and deep fry them without batter. The effect, once the central ring with the attached tentacles hits the oil, is to make them curl into shapes that remind me a little of flower blossoms. Anyway, if you are cleaning tiny squid, or else have purchased them with the whole tentacle section packed separately, you can fry them up in about thirty seconds or so (with or without a light dusting of cornstarch) and serve them piping hot as a lovely little appetizer. You can provide a dip of your choice, if you like, but they are best with nothing more than a quick squeeze of lemon juice. 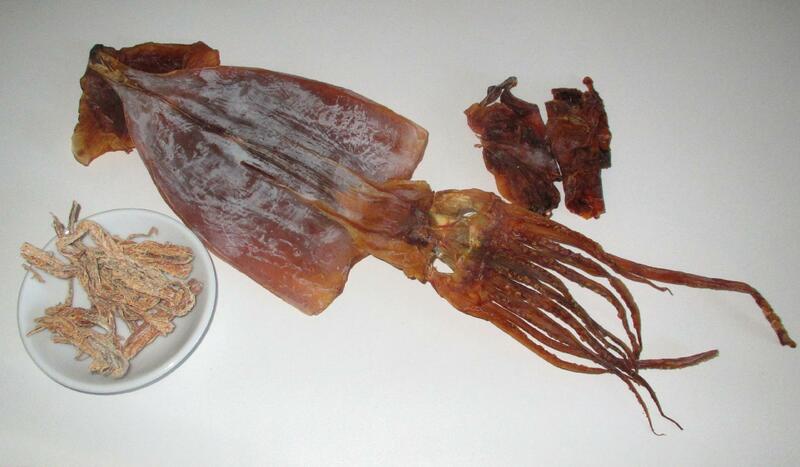 Dried Squid are used quite commonly as a cooking ingredient in the cuisines of China, Korea and the Philippines and are very popular, in various forms, as a snack food, particularly in Japan. The advantages of drying the product are not only for lengthy storage in the absence of refrigeration but, as with most dried foods, the flavor of the fresh article is considerably concentrated and enhanced. When I am at the type of western restaurant that serves deep-fried calamari rings as an appetizer I usually select them because, in such places (with the exception of good Italian restaurants), the rest of the appetizer menu is usually not that interesting. I like deep-fried Calamari most of the time but I also prefer to eat heavily battered deep-fried foods only sparingly, if only as a matter of personal taste rather than for health reasons.